Some say today’s Indonesia is not your father’s Indonesia. A political scientist I know believes that in 15 years all of Indonesia will be under sharia law. I am not so sure. The heart of the secular basis of Indonesia’s republic has always been the Pancasila or 5 principles. They are: Belief in one God, Just and civilized humanity, the unity of Indonesia, democracy guided by the wisdom of deliberations, social justice for all the people. Embedded in Pancasila are the ideas of inclusion, tolerance, religious freedom, and shared decision-making. When disharmony threatens the unity of Indonesia, Indonesia’s leaders summon Pancasila. This is one of those moments. Indonesia has recently experienced: a terrorist suicide bombing at a bus station in East Jakarta that left 3 policeman dead but could have been a lot worse; a divisive election for the province’s governor in which religion became a litmus test, even dividing families; bomb scares at a TV station and the capitol’s and SEA’s largest mosque; attacks by hundreds of ISIS-linked militants in Mindanao, a part of the Philippines only a few hours by boat from the Indonesian island Sulawesi. There have been other similar incidents and although Detachment 88 of the police (formed in the wake of large scale bombings in the early 2000’s) has successfully broken up several terrorist networks, new ones are forming. Linkages between the Mindanao terrorist leadership and Indonesian ISIS supporters have already been detected, worrying security forces . The court’s dramatic sentencing of Ahok Purnama for blasphemy rather than the reduced charge sought by prosecutors, as well as public caning in Aceh and arrests of 141 homosexuals at a Jakarta club, have emboldened analysts and editorial commentators within and outside the country to say that Indonesia can no longer stand by its reputation for tolerance and pluralism. “No political party, however secular, wants to risk being branded as anti-Islam in a nation where close to 90 per cent of the population are Muslims. The danger then is that in this reticence, intolerance may well take root, as hard-line Islamic groups such as the FPI start to dominate the national discourse, thereby corroding the body politic.” (Raymond Chin in Straits Times). The evidence may be there for intolerance, but not for it taking root across the nation. Militant and conservative Islam, much of it imported from the Middle East, is on the rise in Indonesia. President Jokowi knows this and like his predecessors he is fighting back. His steps so far: arrest of Rizieq Habib, leader of the hard-line Islamist group FPI, a group now banned in the central Javanese city of Semarang; detention on treason charges of Muhammad al-Khaththath, leader of the hard-line Muslim Community Forum; a call to legally ban Hizbut Tahir, an international group calling for sharia law, and perhaps others. Furthermore Jokowi has threatened three times -showing heightened emotion to “clobber” (gebuk) any organization that opposes Pancasila. “The existence of Pancasila, Bhinneka Tunggal Ika (Unity in Diversity) and national integrity are fundamental. Don’t ever dare and try to change them,” Jokowi warned. There could be a violent pushback by followers of banned groups or jailed militants ahead but it will be contained by a unified security apparatus. Jokowi’s poll numbers continue to be above 60%, where they have been since he was elected. The hardliners showed their strength in the April Jakarta governor’s election that pitted a double minority candidate (Christian Chinese) against a moderate Islamic one but what happens in elections between Muslims ? The 2014 Presidential election (between two Muslims) did feature some commentary that Jokowi was Chinese, or not a real Muslim, meaning he was too liberal. But it was marginal. Could 2019 be different ? Perhaps. But I am an optimist; I suspect enough Indonesians believe in Pancasila. 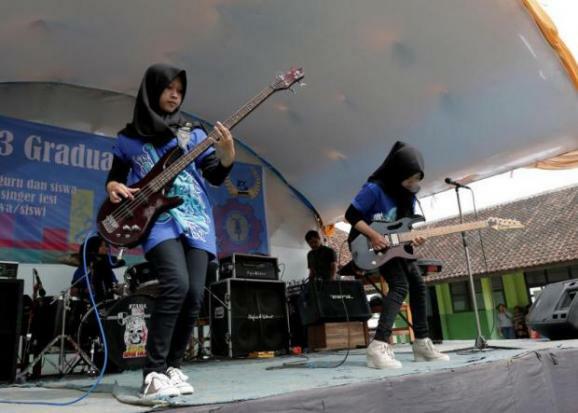 One example: news reports this weekend highlighted “VoB”, a West Java heavy metal band composed of three hijab-wearing teenage girls.